This month’s challenge was to try something from a Threads Magazine. The challenge I found was “Material Mix” from January 2013. I was already planning on trying to knock off my favorite ready-to-wear skirt purchased from Costco a few years ago, so I thought I’d try and make it in two fabrics and duplicate the kick pleat, also covered in the same issue. 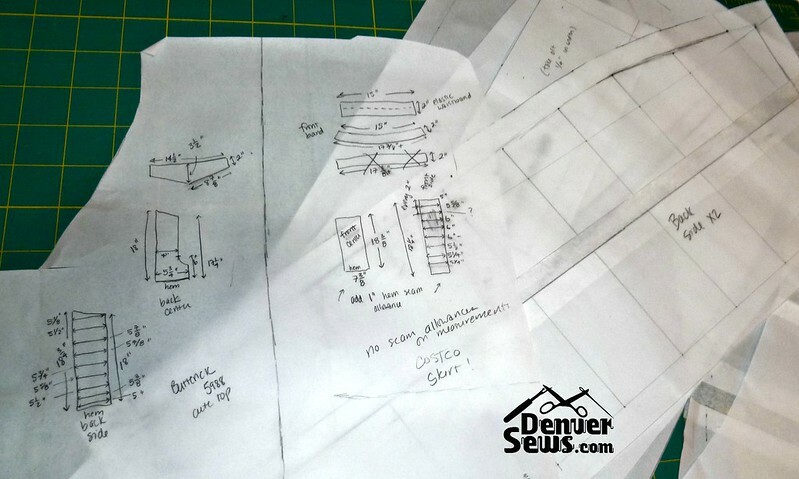 I started by measuring the Costco skirt carefully and copying it onto drafting vellum to turn measurements into pattern pieces. (Thanks, Jill, for suggesting this method!) I then added 2″ in overall circumference to adjust for my newer girth. The original skirt was made with a substantial ponte knit with stretch. I really like the design of this skirt, especially the triangular piece in the back, but the fabric is starting to pill. The knock-off also needs to stretch, so I had to look through my stretch knit stash. There were a few possibilities, some involving non-stretch fabrics mixed with stretch. In the end I chose two similarly weighted ponte knits. After all, this was essentially my muslin and I didn’t want it to go too wrong the first time. The original skirt also had a kick pleat that was not too hard to figure out just by looking at it. The Threads article gave some additional directions reinforcing what I could already see. They suggested using interfacing, but I didn’t feel it was necessary and left it out. I think in the end, my two fabrics were too lightweight and the skirt could have been a bit more snug. I’m also not sure I like the grey center pieces. I think two less-contrasting colors would have been better. When I have more time, I might make this skirt again with a heavier-weight non-stretch fabric for the center panels and a heavier-weight stretch fabric for the waist and sides. For now, this black/grey rendition is not a bad start and I do love the kick pleat! Lynne – you did a fantastic job copying your RTW skirt and mixing in different materials. You impress me so! I like pbennett2014’s idea to “[a] stripe cut diagonally, creating a V down the center back would look fabulous with coordinating solid color side”. This would be a very cool affect. But I am more interested in your fabric swatch tags. Have you blogged about this? Have you brought this to a meetup & I was under a rock? I like the different greys on your skirt and I know from experience that kick pleats ain’t easy so well done you!! Wear that skirt with pride! Your skirt is really nice. 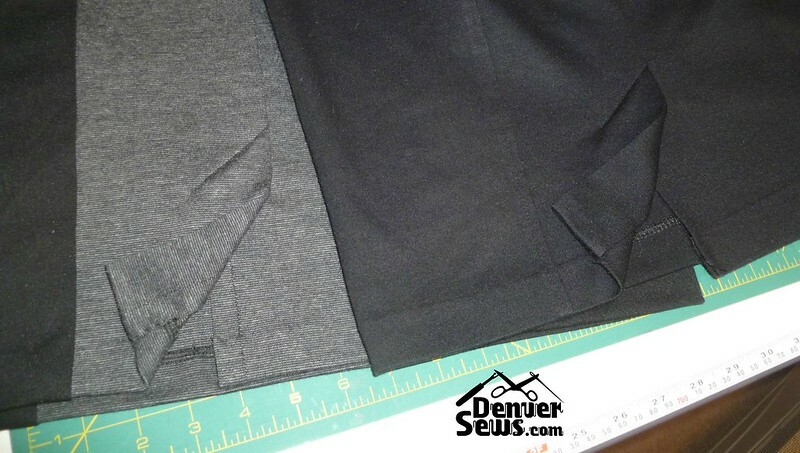 I use the apparel interfacing (Black Easy-Knit) Fusible for a little more body of the ponte knit. I like the two tone skirt. The band on the skirt is pointed toward the hips? That is really spot on. Your skirt looks well fitting and nicely put together, you did an excellent job on the knock-off pattern designing! I concur with Jamie. 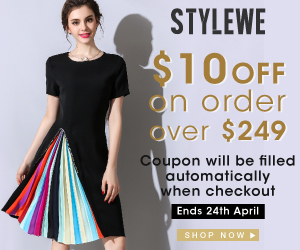 I thought you simply modified your existing skirt. Well done! Nice! Very impressive job of successfully copying the original. It creates a nice outfit with that top. I like the idea of trying it with woven center panels and heavy-weight knit side panels. I think a muted plaid or stripe cut diagonally, creating a V down the center back would look fabulous with coordinating solid color sides. You could even modify the V-shaped inset to parallel the diagonal lines of the plaid or stripe. Yes, I love the contrast panel too. Great job Lynne. I really like the contrast panel! When I first looked at the pic I thought you ripped out the center panel and replaced it because it looked like exactly the same skirt, so you did a good job with knocking it off.